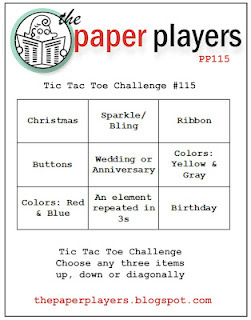 H2 Designs: The Paper Players Challenge #115 - Time for Tic Tac Toe with Anne Marie! The Paper Players Challenge #115 - Time for Tic Tac Toe with Anne Marie! I've used three of the framelit label dies, with the sentiment one turned in the opposite direction to the other two, & then layered these onto an embossed background. Hope you can join us this week at The Paper Players!